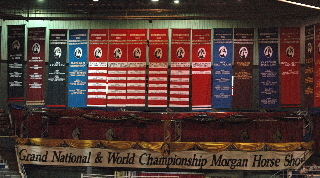 The 2005 Grand National and World Championship Morgan Horse Show got off to a rousing start with a new schedule beginning on Saturday morning. The first day featured three sessions of in hand classes in the coliseum that produced a history-making start. Peter Fenton called five yearling geldings into the coliseum Saturday morning, officially kicking off the show Morgan enthusiasts have been preparing for all year long. Judges Phil Price, John McDonald and Joyce Swanson had the tough task of choosing the morning’s champions. When the first cards of the show were turned in, Bravo Zulu (Three Wishes x Miss Daisy) was named the first Grand National Champion of the week. This fancy bay was led by Cheri Barber for Tulsa, Oklahoma's Mountain Ridge Farm. Papa D’s Donnatello, handled by Brian Hadley, wore the reserve streamers out of the ring. 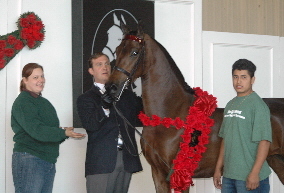 Papa D’s Donnatello (HVK Grand Entrance x Raintree Isadora) is owned by Michael Grabowski of Phoenix, Ariz. The two-year-olds made their way to the ring next and 10 bright geldings flashed their presence in front of the panel in hopes of earning the top prize. Following the initial inspection of all 10 entries, the judges asked five to come out of the lineup for a second evaluation. After the judges compared the entries side by side with their fan clubs encouragement, Miramax (Salem Command x Only Forever) represented the future of Peeper Ranch of Lenexa, Kan. as the champion with Phil Fountain on the lead. Kurt Hufferd guided the Nostrodomas son SpringMill Medicine Man to the reserve honors for SpringMill Morgan, LLC. TE Amunition and Whitney Bodnar, Graywood's Lear with Richard Boule' and Bears It All presented by Jeffrey L. Bessey rounded out the competitive top five. Following the first round of competition for the yearlings and two-year-olds, the top two entries from each class converged for the Junior World Championship Gelding competition. Miramax again strutted his stuff to the beautifully adorned presentation area for the world champion honors while SpringMill Medicine Man again followed in the ribbons for the reserve world championship title. A unanimous decision put a majestic Simply Maserati son in the winner’s circle of the three-year old gelding competition. Robert Hughes led SLB Andiamo, who is out of HVK Obsidian, to this well-deserved victory for Sheryl L. Bartolucci. Brian Stewart presented King Lehr’s Friar Tuck to reserve with a dynamic showing for Terry King of Seville, Ohio. The Grand National Four-Year-Old Gelding title featured the reigning World Champion Gelding Dragonsmeade Carnegie Hall (Beethoven x Black Tie Debutante) staking his claim to repeat the honors. The eye-catching bay was shown by Tim Roesink to a unanimous victory for William and Shelley Silber's Kourt Jester Morgans of Falmouth, Maine. Bill Grundmeyer took over the lead of the big and fronty BJL Ransom (FCF Val D’Isere x Minion Baby Doll) to reserve honors for trainer Diane Conrady and owner Barry Laub and Maynegate Morgans of Homewood, Ill. Seven mature geldings entered the ring next for the Grand National Five-Years & Over Gelding class. Stonecroft Sudden Impact scored this win with Jaisen von Ballmoos handling the Stonecroft Masquerade son for Robert & Loek Neimeth of Falls Village, Conn. Receiving a warm applause from the Grand National audience, the defending champion HVK March Flaire (Noble Flaire x HVK Dragonfly) earned reserve honors with Bill and Sammi Hazen presenting for Jacqueline Clapp of Lexington, Ky. The top two from the previous three classes met in the coliseum next for the crowning of the World Champion Senior Gelding. Intesity was high as the six top contenders put on their game faces in front of the three judges. 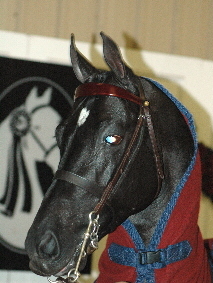 Repeating his win in the senior division from 2004, Dragonsmeade Carnegie Hall stood out among the fine group, wearing the tricolor back to the Grove Pointe tack room. Stonecroft Sudden Impact made quite an impact in his first journey to Oklahoma as he proudly carried the reserve honors back to Misty Meadows Farm. Moments later, contenders vying for the esteemed World Champion Gelding title closed out the first session of this year’s show. The top two from the junior division as well as the top two from the senior division gave it their best shot, however there was no stopping Dragonsmeade Carnegie Hall from wearing the roses for the second year in a row for his elated owners and trainer. The mature horses prevailed as Stonecroft Sudden Impact was named the Reserve World Champion Gelding. Opening day at the Morgan Grand National continued with the Saturday matinee session featuring the Mares In Hand competition. Twelve yearling fillies entered the ring first to compete for the grand national title in front of the in hand judging panel, which again consisted of John McDonald, Phil Price and Joyce Swanson. New England Regional's Grand Champion Mare, MEM Shock & Awe (Serenity Masterpiece x AFF Evening Episode) topped the class with a commanding presence with Rick Lane presenting for George Schott's Maine Event Morgans. Representing the storied Treble's Morgan Manor breeding program, the white trimmed chestnut Treble’s Pomp & Byzazz (Stonecroft Byzantine x Relentless) followed in the ribbons for reserve with David Rand on the lead. The two-year-olds came in the ring next and the pretty On Line daughter Christina Dellarose, out of Troutbrook Gypsy Rose, topped the class. Mike Carpenter presented the expressive young mare to this title for Linda Langlois of Deerfield, N.H. HDP War Dancer (Carlyle Upper Caisse x Woody’s Flashdance) finished up with reserve. Damian Hyde handled HDP War Dancer for Margaret Muns and Melinda Hyde of Wixom, Mich. The best of the yearlings and the two-year-olds came together next for the World Champion Junior Mare competition. MEM Shock & Awe again showed great promise for the future as she was called out of the line up as the world champion with Rick Lane. Christina Dellarose made another victory pass out of the coliseum, this time as the reserve champion with Mike Carpenter at the lead once again. The three-year-old mares were next and the top two in this class would ultimately compete in the World Champion Senior Mare competition later in the afternoon. Keith Nelson led Decadence, an elegant mare by WWW Reality Check Dot Com and out of Wide Eyed Innocence, to the impressive title for Debra Wooley Lee of Eugene, Ore. Rick Stevens handled the lead of Narragansett Spirit, a chestnut mare by Century Free Spirit and out of Fashionability, the reserve champion in her first trip to Oklahoma for Hobby Horse Enterprises. Peter Fenton next made the call for the four-year-old mare contenders and eight entries entered the ring to have their conformation scrutinized by the panel. After a very thorough inspection, Hylee’s Seven Roses (Hylee’s Galaxy Seven x HVK Irish Wild Rose) earned the judges’ approval with Glenn Bouvier at the lead for Jane Steffenhagen. Tim Roesink continued his success in the in hand division by showing off the refined mare, MEM So Emotional (Futurity French Command x Miss Bluegrass) to reserve honors for new owner Ann Hailey and Copper Beech Morgan Farm. The Five and Over Mares class concluded with a unanimous decision for a defending champion. The judges were in agreement that the beautiful bay mare Long Acres Broadway was once again the champion. Kurt Hufferd led the winning mare, sired by Tug Hill Whamunition and out of Mantic Mardi Gras, for A. Russell and Jeanette Quilhot of Columbia City, Ind. 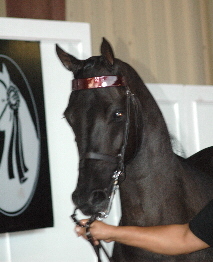 The HVK Bell Flaire daughter Prada claimed the reserve position with her expressive ways as Robert Hughes added another tricolor to the Blackridge banner. The World Champion Senior Mare competition followed and this class was comprised of the top two finishers from the three-year-old, four-year-old and five and over sections. After capturing the attention of both the judges and the crowd in the previous class, Long Acres Broadway again made her presence know as she was called out of the line up as the World Champion Senior Mare for the third year in a row. 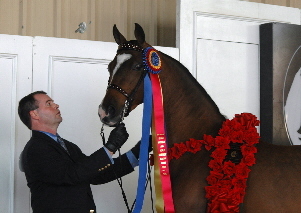 Decadence, winner of the three-year-old class, received the crowd’s appreciation of her brilliant show when she was named the Reserve World Champion Senior Mare. After a brief intermission, the champions and reserve champions from the junior and senior mare world championships came together for one final evaluation in the session’s finale, the World Champion Mare class. For the third year in a row, Long Acres Broadway scored the distinguished title to continue the precedent of repeat champions. Decadence certainly made her presence known in just her second show ever as she earned the Reserve World Champion Mare title for Debra Wooley Lee. The afternoon session in the coliseum closed out with a pair of carriage driving classes taking center stage. HVK Hard Rock and Tristanne Weber Childress drove down victory lane with the Reinsmanship Singles title with a stylish drive for Marilyn North. The versatility of the Morgan shonw as Wintergreen Sultana and Jill Countryman picked up the reserve ribbon in the 13 horse class. The beautifully turned out pair of Denbury Regal Justice and Denbury Irish Justice were popular visitors to the winner's circle with owner James Brown at the whip.Not only did the polish off the afternoon session as the Reinsmanship Multiples winners, but the opened the evening session with top honors in the always poignant Heritage Salute To America. Following Canada's and the America's national anthems, the first evening session of the Grand National and World Championship Horse Show opened with the Grand National Heritage Salute to America - Single/Multiple Finals. At the conclusion of the class, Bill Carrington announced the winners to be the pair of Denbury Regal Justice and Denbury Irish Justice. Owner James Brown again directed the pair to victory. Reserve went to the multi-titled Greentree Brigadier, who was shown by Cecily Creen Yelek for Greentree Ranch. Following the carriage class, Fern Bittner, who will retire from her managerial duties following this year’s show, was honored for her 13 years of outstanding service to the show. 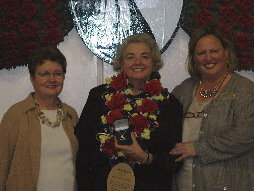 The show staff presented her with a beautiful plaque, championship garland and a necklace with 13 diamonds, thanking her for being the teacher, colleague, boss, mentor and most of all friend that she has been over the years. Ten excited-about-life yearling colts had their chance to shine next, as the gate opened for the Grand National Yearling Colt competition. The powerful young stallion Cedar Creek Cariad (HVK Bell Flaire x Cedar Creek Wind Chime) demanded both the judges’ and crowd’s attention as he was named champion with John Hufferd handling for Cedar Creek Farm. Whitney Bodnar presented Cingate Lucky Star (Astronomicallee x Flirtatious Me) to a strong showing for the reserve ribbon for Cingate Morgans LLC of Montgomery, Ala. The future stars of the industry continued to shine in the two-year-old class. When the cards were turned in it was the energetic SYP High Definition by HVK Vibrance and out of Kim’s Bellegante who was selected to wear the grand national tricolor. Rick Stevens led SYP High Definition for proud owner Heidi Kunkel of Webster, Ma. Right on their heels, and with great crowd support, Kosta Boda (Mizrahi x Abacus Simple Dreams) and Bob Hughes made their way to the presentation area to collect the reserve ribbon for Copper Beech LLC of New Albany, Ohio. The best of the previous two classes met head to head next for the World Champion Junior Stallion class. Heidi Kunkel’s SYP High Definition, again with Rick Stevens, made his second big impression on judges Price, Swanson and McDonald for the victory while Kosta Roda and Bob Hughes once again put the pressure on the winners for the reserve world championship title. The preliminary rounds for the World Champion Senior Stallion title began with a fine group of three-year-olds proving themselves worthy of the roses. The 2004 aned 2005 Junior World Champion Stallion, TRE Master of Disguise (Stonecroft Masquerade x WTS Wing And A Prayer) made his cheering section very happy as he boldly trotted out of the line up as champion with Bob Kellert at the lead for Debra Hurst Walters, San Diego, Calif. Another crowd favorite, Way Beyond Reason (Aljaks Double Whammy x Rhyme and Reason) represented the East coast in grand fashion as he picked up reserve for Chris and Andrea Kelley of Pembroke, Ma. Peter Wheeler and Ann Anderson directed this vibrant stallion to the strong finish. Intensity continued to build on the show’s opening night as the four-year-old stallions put on their best performances. Pinecreek Noble Vision, a striking son of Nobility, and out of Nemours Celestial Lady, made his presence known in Oklahoma as the 2004 Park Harness World Champion as just a three-year-old. A year more mature, he was back to show off his good looks and stylish presence as Steve DeBolt presented him to the tricolor for owners Michael and Mary Penn. Bob Kellert was right back in the presentation area as he teamed AMHF Absolut Grandeur (Chandel Absolut x Delusions Of Grandeur) to the reserve finish for David and Cindy Vogels of Littleton, Colo. The spotlight was next on the gorgeous black stallion LPS The Boogie Man (Man About Town LPS x Honeytree’s Simply Unique), who made a solo performance to capture the five and over title with trainer David Rand at the lead. The big-moving Boogie Man represented the Morgan breed in perfect fashion by again claiming the World Champion Senior Stallion title before closing out a historic three-peat as the World Champion Stallion for the third consecutive year! This sharp stallion is owned by Michael and Nancy Ramsey of York, Maine. Four-year-old champion Pinecreek Noble Vision stepped up to the plate for the reserve streamers in both the Senior and World Champion Stallion classes. The first day of competition was in the record books and for the first time in Grand National history all three In Hand World Grand Champions successfully defended their titles. Dragonsmeade Carnegie Hall, Long Acres Broadway and LPS The Boogie Man made history as they continue to set the standard for the Morgan breed in 2005. 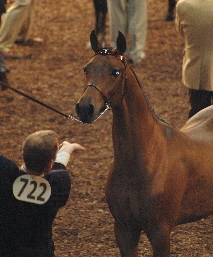 Equitation was the feature attraction to start the show in Show Arena 6. Saturday was a gorgeous, crisp fall day that was only matched by the crisp riding of the saddle seat riders. After leading The Saddle Horse Report’s high point standings most of the season, Tiffani Earehart continued her winning record with a blue in the saddle seat 16-17 age group. Meeting her in the winner’s circle was her father/trainer David Earehart as well as instructor Erin Boggs. Second in this deep class of 13 was Brooke Gove mounted on Hollybrook Romeo under the direction of Cricket Hill Farm. Ariana Corrigan continued her string of Grand National titles by turning in a precise ride on Festival Troubadour in saddle seat 14-15. Anne Speck was the winning instructor. Moving up an age group this year, Emily Buchanan was second on CO Perfect Timing for Wichita Riding Academy. With poise and polish beyond her years, Katherine Alderman was the unanimous choice of nine riders in the 12-13 year old competition. She and partner Minion Absolut were yet another top team for Cricket Hill. While not unheard of, there is not an overabundance of young men in equitation. More than holding his own, Ben Walstrom earned a good reserve for proud instructor Katie Mair as he was teamed with DDM Nightwind. In an unusually light class of three, Caroline Gaker earned a well-deserved unanimous first place in the 11 and under class. Keeping it all in the family, she was riding her brother Nelson’s horse, Wind Blu Supreme Fantasy. Second place went to Malia Meyer, riding Season’s Major Firewing and coached by BJ Schaefer. Abby Smith, matched with Triton Nathan, was selected the best of six riders in classic equitation 13 and under. Picking up the second place streamers after a skilled ride was Kelsey Bornt on Manistee Lee Mistral under the Rolling Oaks banner. Closing out the morning session, the classic equitation 14-17 class featured ten riders riding hard for top honors. For the second year in a row, Jean DeGutis was the winning instructor. Last year it was Musette Re’ Kyranos in the winner’s circle. This year Brittany Schilling had the distinction of getting the judges’ votes for first. Also taking the second place ribbon back to the Northeast was Kahla Buthlay, riding Elizabeth Sue under the direction of Laurie Koehler. The afternoon session in Show Arena 6 consisted of western equitation and junior exhibitor fitting and showmanship. Leading off the session were the preliminaries for the AMHA Western Seat Gold Medal. With an abundance of riders, there were two splits of ten riders each. Each split featured group rail work and individual patterns. The top ten rides selected to return in the finals later this week are Leah Soubel, Jenna Britt, Kali Erin Hutchinson, Natalie Nelsen, Laura Conway, Michael Coughlin, Scott Nevers, Ellen McQuade, Sondra Leigh Edwards, and Logan Nicole Mather. There was plenty of interest from the junior exhibitors to develop a good base of experience in the fitting and showmanship finals. Fourteen impeccably turned out entries were shown in the 13 and under class. Danielle Crockford’s expertise showing Celtic Rose Centurion caught the judges’ attention for first place. This Canadian team made this a truly international show. Tying a strong reserve was another entry from north of the border, Liselle Oliveira showing SGP Game Of Chance. The 14-17 finals featured 12 skilled young horsemen, the best being Jocelyn Bos-Fisher showing HFM Sky High. Bos-Fisher is a multitalented equestrienne also having competed successfully this year in all three equitation seats. Jessica Geissinger showed SMS Annalark to her best advantage for reserve. Geissinger also competes in western and hunt seat equitation. The evening session kicked in with a plethora of hunt seat equitation on the flat competitors. With twenty-four entries the 16-17 age group was split into two sections of twelve each. In the first split, Caitlin Novotny proudly represented Oklahoma as the winner mounted on Janie aned Bradford Denning's Lone Star Bill. Britni Olsen received a good ovation for her second place ride aboard Roadshow Jesse James. Winning the second split of the 16-17 with quiet confidence was Laura Pecherski and Bre Schultz's steady mount Ha-Ho Windstar coached by Katie Mair. Second place went to multi-titled Kate Podell riding Wintergreen’s Sultana under the Bittersweet banner. The 11 and under win was a popular one featuring Brianna Berg riding the veteran Kern’s Endeavor under the direction of proud instructor Christina Stewart-Mitchell. Reserve in the five-entry class was pert Lexi Chruscicki on Quaker’s Astrid coached by Sally Lindabury. Ten 12 year olds vied for the panel’s attention. Rising to the top was Kelsey Robinson matched with Melendy Cash Mare. Bryanna Shoepke earned reserve honors as she presented Rustic V's Thunderheart. In a unanimous decision, two-time defending Junior World Champion Alyssa Rumsey trotted off with the 13 year old title on Merriehill The Lion King. She was met in the winner’s circle by instructor Mary Carlton. In yet another unanimous decision, the second place rider, Elizabeth Fawcett, matched with H-Vee Hawk's Saralainewas, met with screams of delight from her fans at Trotwood Stable. Closing out the evening session, twenty-one 14-15 year olds competed in the largest undivided class of the day. Grinning all the way back to the barn was happy winner Jordan Cusumano on BlkOrchid Ace Commander and proud instructor Katie Mair. Reserve in this tough class was Sarah Jaromin teamed with Final Analysis. On the opening day, Show Arena 9 was devoted to Dressage. With dressage continuing to grow in popularity and gain followers, this venue was packed with quality entries. While entries came from all across the country, the West was well-represented with eight of eleven classes won by teams from the western US and Canada. The 7-entry training level test 2 open was swept by the husband-wife team of Jennifer and Earl McFall competing on the versatile show ring champions Briar Oaks Pep In My Step and UVM Columbine respectively. Both entries are owned by Sandra Nelson’s Madison Avenue Morgans in Nevada City, California. Misty Green Mechant, ridden by Jane Fucinaro, was the top junior exhibitor entry for training level test 2. A Georgia-based team, Samac's Heart of Gold and Jamie Michelle Clarke earned the reserve tie in the field of 10 entries. The upper level classes were understandably lighter. Putting on a solid exhibition in third level test 1 were WTR Chocolate Bar and Marlo ViVenzio for owner Wendy Gray Bizzaro of Park City, Utah. The best of the five rides in first level test 1 – open were SGP Raizin Kane and Lynne Salewski for owner Christine Laine. Reserve was awarded to Wintergreen Don Diego and his partner Susan Garmier riding for owner Ann L. Taylor. Amateur riders were next up for first level test 1. Dragonfire Kirin and Natalie Jensen took first place honors back to California for Dragonfire Farm. Reserve was Derwanda Hercules, guided by partner and owner Gayle Davidson. Junior exhibitor first level test 1 was held concurrent with the AMHA Dressage Gold Medal Finals. Five entries competed for test 1 honors while 10 riders contended for the Gold Medal. Cin-O-Rama Savoir Faire and Sarese Reed came out on top in test 1. Reserve was the team of Jax Untouchable and Carly Dodrill. Going two for two, Sarese Reed showed that not only could she achieve good results with her horse, but she did it in correct form to earn the AMHA Dressage Gold Medal. Brandi Carter, competing only in the Gold Medal Finals earned reserve with poise and precision aboard Wintergree Strike. Fourth level test 1 saw four solid competitors. Earning a valued blue was Wintergreen Fortune ridden by Susan Garmier for Potter Investment Co. Reserve winner Greentree Courtney was one of two entries ridden by Marlo ViVenzio for Wendy Gray Bizzaro, a staunch supporter of Morgan dressage competition. First of 3 entries in second level test 1 were Northern Exposure and owner/rider Kathy Padgham from Alberta, Canada. Reserve was West Mt Christopher with David McMillan for owners Larry D and Karin Lynn Weight. Wintergreen Sienna showed impressive poise for a junior horse in her win in the 8-entry open training level test 3 for Susan Garmier and owner Anne L. Taylor. Reserve were Rough Diamond Flashback and Alejandro Salazar competing for Rough Diamond Ranch. Closing out the day’s dressage competition was a good win for owner/rider Jaime Lee Hardy and Rogue Hill’s Woodsman in amateur training level test 3. This win continues the success this team has seen all season in the Northwest. Suntime Celebration and owner/rider Karen Wolfsheimer celebrated their reserve in the strong 9-entry class.